Osegyehyang Buffet is a relatively new vegetarian restaurant located just outside exit 1 of Achasan station (line 5). There is also an Osegyehyang in Insadong, but it is not a buffet. It is operated by members of a religious group that runs several other restaurants in Korea and throughout the world, including SM Ching Hai Buffet near Yangje station. 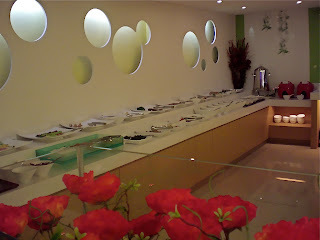 It is like the buffet from SM Ching Hai plus several menu items from Osegyehyang plus much more. If you have not been to any vegetarian restaurants in Korea, it's not a bad place to start because there is a large variety of food to select from. The buffet is huge. The menu on their website lists 37 hot dishes, 27 cold dishes, 29 salad items, 24 desert items, and 7 special items. Some of my favorites are fried mandu, scorched rice with mushroom sauce, mushroom roll with hot sauce and fried soy protein with sweet and sour sauce. The restaurant is very spacious and would be an ideal spot for large groups. It is open for lunch from 12:00-15:00 and for dinner from 18:00-21:00. Price: 13,000 won for lunch and 15,000 won for dinner. 15,000 won on weekends. Find out more about the Seoul Veggie Club at http://seoulveggieclub.wordpress.com or visit them on Facebook.